The Fellowship was fortunate enough to obtain a copy of LIVEWIRE #5 from Valiant Entertainment. The story is written by Vita Ayala; with art by Kano, and lettering by Saida Temofonte. Amanda/Livewire is trying to locate a young psiot named Phoebe Daniels and take her back to her family. She is under control of The Psiot Safety & Education Program; a government sponsored program designed to help control their abilities and be productive citizens. Amanda doesn’t buy that for a second. Having believed that she may have located their headquarters, she investigates only to discover it’s a trap. She is captured and brought before PSEP’s leader Ms. Byrne. What do they have in store for Livewire, and does it involve Phoebe? Now that the foundation has been laid with the opening arc, the fun begins. 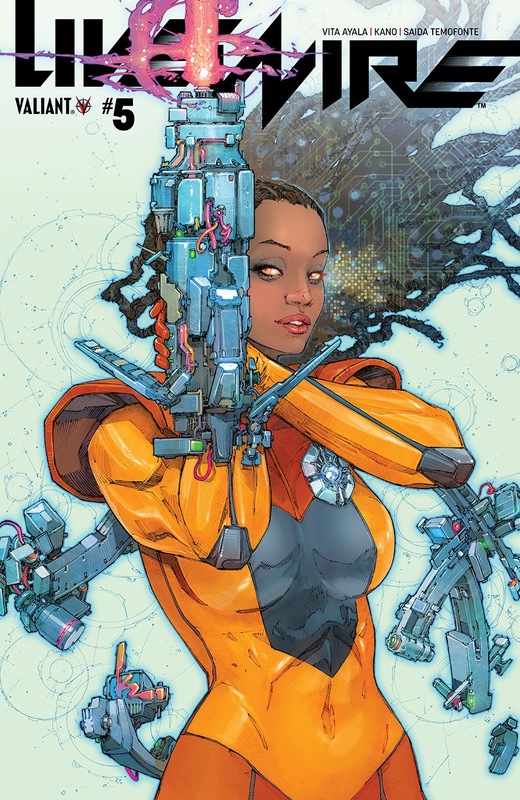 Vita Ayala has done a great job proving that Livewire is worthy of a solo book. She handles the mixture of superhero action with espionage while not sacrificing character development of Amanda. Kano is no stranger to the Valiant universe, and is a nice addition to the lineup. The colors really knock me out on this issue; both bright and muted at the same time. It’s not too late to jump on this series…which you should. LIVEWIRE #5 is in stores now or available at www.valiantentertainment.com.